1989; 323 pages. #7 in the Discworld series. Genre : Fantasy. Overall Rating : B+. Teppic is an apprentice in the Assassins' Guild in Ankh-Morpork. He is also the son and heir-apparent to the God-Pharaoh throne of Djelibeybi, a long, narrow, desert kingdom along the Djel River. Which takes precedence when Pops passes on and needs a pyramid built for his mummy. This is a fairly early book in the Discworld series, which means it is full of zany metaphors and similes; and lots of wit. There are some great characters - Teppic, Dios (the chief priest), Ptraci (a handmaiden, whatver that is), and the world's greatest mathematician (who likes to chew his cud). As usual, Pratchett spoofs a bunch of themes here. Among them are : pyramids (naturally) and Egyptology. The latter includes both ancient practices like burying food in the pharaohs' tombs (a lot of good that did), and modern New Age silliness, such as wearing little pyramid hats to give your brain good vibes. Hey, I've taken part in psychic fairs - people really do wear those contraptions. Pratchett also takes on Greek philosophers and Quantum Mathematics. On a slightly more-serious note, Pratchett explores whether people (in the book, or in the past/present real world) truly would want whatever god(s) they follow to come down and dwell with among them. An interesting question. There really aren't any negatives to Pyramids. The storyline and ending are good, and even the bad guys have redeeming qualities. The worst I can say is don't make this your first Discworld book. 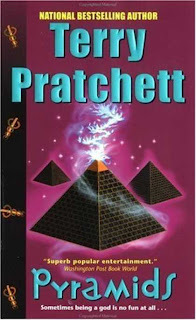 Pyramids is sort of a blind alley for Pratchett - ANAICT, all of the main characters are here only for this one book. They never turn up again in the 20-odd Discworld books that follow. "Nothing but stars, scattered across the blackness as though the Creator had smashed the windscreen of his car and hadn't bothered to sweep up the pieces." Yeah. Milton would be jealous. Very very soon I'll be reading my first Pratchett, possibly two of his books. I'm looking forward to it. Oh, I was going to ask, are you reading these relatively in order now? I mean, starting with the early ones and then progressing? I know that's not how you started out. Just curious. nope, which is rather un-OCD of me. the nice thing about the Discworld books is that - except for the first two - they all are stand-alones. yeah, i sometimes have no idea when a new character first got introduced, but it's NBD. also, at the back of each Discworld book is an Appendix, where most of the main characters are briefly detailed. that's a handy reference. When I was out on all my Half Price Books trips this week, I saw several nice copies of The Light Fantastic, but remembered that was the second one and you said the first two needed to go together. I couldn't find the first one, so I just left The Light Fantastic on the shelf. I figure I probably ought to read some Pratchett before I start buying his books, yes? the library should have a bunch of them. #1 is "The Color of Magic", but i don't know that it would be my recommendation for your first-read. Pratchett was still finding his footing, and there are one or two "R-rated" allusions in it, which doesn't happen in any of the subsequent books. "Guards Guards" would be a good one to start with. it's witty, with lots of punnish metaphors, and it happens to introduce one of the lovable main characters - Carrot. it would also give you a good indication as to how much you'd like the rest of the series. if you find Guards/Guards "meh", then there's no need to read any more of the Discworld series. I'm starting with the Discworld for younger readers books - the Wee Free Men and The Amazing Maurice and his Educated Rodents. Those are the ones that won the poll at my blog, and the ones that Byron originally recommended to me. Both are on the way from the library now. Well, Mandy, I hope you like Pratchett, I'm fairly sure you will. Those YA books are really good, I don't think he puts any less effort into them. I'm not sure what qualifies them as YA instead of just fantasy, perhaps the book length is shorter? Byron, I'm also looking forward to reading Nation, which I believe is unconnected to Discworld. I've heard so many good things about Pratchett all over the book blogosphere. for some strange reason, whoever's been reading these and then selling them to the used-book store doesn't read the ones with witches. the only exception being Equal Rites and i think that one is a Wizards/Witches hybrid. Hamilcar-Thanks for the recommendation of "Guards Guards" to start with. I was clueless on which of Pratchett's books would be good to read first. I'll add it to my TBR list. Byron's recommendations are good too. The "witches" ones are early in the series i think. one is "Wyrd sisters". Pratchett added more species as the series wewnt on. By "Thud", we have vampires, werewolves, trolls, and golems - in addition to the humans, dwarves, and dragons from the earlier books. since i'm not reading these in order, it was a bit confusing trying to deduce how each species felt about the others. Werewolves hate Vampires, and vice versa. these sort of things were easier to deduce in the early books.